Road markings - cycle lanes, road signs, red routes, speed humps, yellow lines. Roads and highways - canals, flooding, drains and gullies, access requests, closures and diversions, road works, personal injury, potholes, street furniture, gritting, snow clearance, walls, verges, spillages. 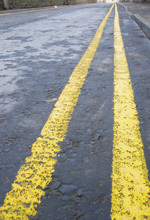 Report faults and defects to The Highways Hotline between 8am and 6pm. Tel: 0300 111 8000. Calls will be charged at a local rate. For Minicom: 01785 854034.